Look at this handsome set of pots and pans! 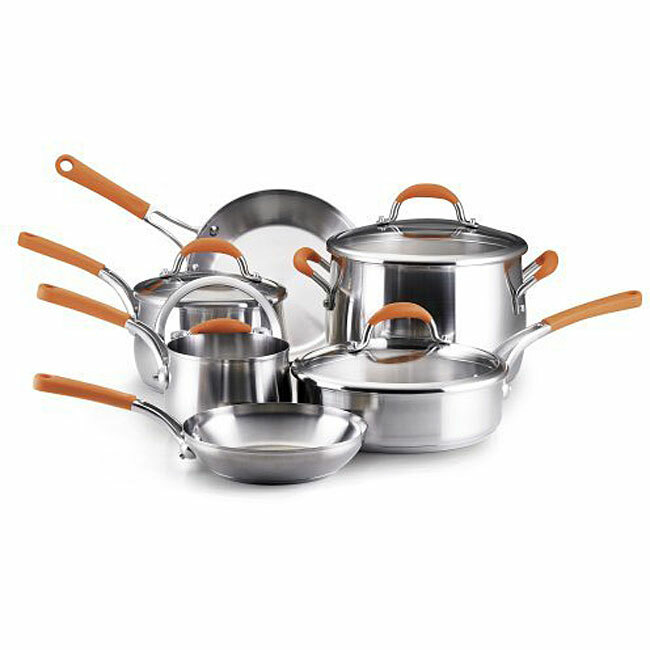 Try your cooking skills with this popular chef's recipes and prepare delicious meals with the Rachael Ray Stainless Steel 10-Piece Cookware Set. This stylish, functional collection of cooking pans includes saucepans, stock pot, saute' pan, and skillets and has special qualities that will perform well in any kitchen setting. The orange silicone handle grips are especially attractive and stay cool to the touch for stovetop meal preparation. Glass lids on these cook pots lock in nutrients and flavors, and offer easy viewing of vegetables and meats while cooking. Stainless steel with aluminum capped pan bottoms Enhances quick, even heat retention and provides energy saving benefits. Stylish, functional pots and pans Offer sleek look for any kitchen decor. Interior smooth surface Resists absorbing acidic or strong flavored foods. Corrosion and scratch resistant surfaces Make the cookware easy to use and time saving to clean. Riveted handles Stay tightly attached and will not bend, warp, or break. Silicone handle grips Cushion the hand, stay cool to the touch for stove top cooking. Glass lids Allow looking at cooking progress without lifting the lid and losing heat.